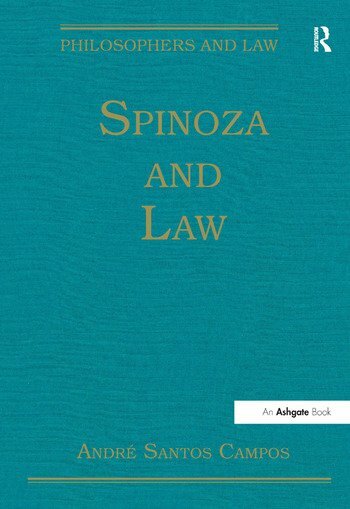 This volume collects some of the best writings on Spinoza’s philosophy of law and includes a critical examination of Spinoza’s theory of the types of law, his natural law theory, as well as the modern reformulation of his approach to the nature of laws and to natural rights. This collection of essays (some of which are published in the English language for the very first time) shows how Spinoza was able to deliver a revolutionary idea of natural law that breaks away from the traditions of natural law and of legal positivism. The bulk of Spinoza’s references to law derive from his metaphysical and political texts, but they have sufficient depth in order to form a groundbreaking theory of law that has been somewhat neglected by modern jurisprudence. The volume also features an introduction which places Spinoza’s writings in the context of modern jurisprudence as well as an extensive bibliography. It is suited to the needs of jurisprudence scholars, teachers and students and is an essential resource for all law libraries; it is also essential to anybody who wishes to engage in Spinoza studies nowadays, whose practical philosophy has received a recent boom in attention by readers throughout the world. Contents: Introduction. Part I Spinoza’s Theory of Law: Spinoza’s theory of law, Huntington Cairns; The power of law. Spinoza’s contribution to legal theory, Hans Gribnau; Spinoza’s critique of law, Roberto Ciccarelli; Divorcing power and reason: Spinoza and the founding of modern law, Benoit Frydman. Part II Natural Law: Spinoza’s treatment of natural law, Errol E. Harris; The state of nature and its law in Hobbes and Spinoza, Edwin Curley; Spinoza as natural lawyer, Aaron Garrett; The natural law, Matthew J. Kisner. Part III The Nature of Laws: Laws in Spinoza and Saint Thomas Aquinas, Gérard Courtois; Law’s normativity in Spinoza’s naturalism, Otto Pfersmann; Spinoza's conception of law: metaphysics and ethics, Donald Rutherford; Laws of nature, André Santos Campos; Spinoza, Kelsen and the nature of the legal norm, Diogo Pires Aurélio. Part IV Civil Law and International Law: The concept of civil law in Spinoza, Gail Belaief; Natural law, civil law, and international law in Spinoza, Manfred Walther; Spinoza and international law, H. Lauterpacht; Spinoza and the idea of reason of state, G.A. van der Wal. Part V Individual Rights: Esse sui juris and political science, Paolo Cristofolini; Spinoza on positive freedom, David West; Spinoza on natural rights, Theo Verbeek; Spinoza on being sui iuris and the republican conception of liberty, Justin D. Steinberg. Name index. Andre Santos Campos is Lecturer in Philosophy of Law, Early Modern Political Thought and Ethics at the New University of Lisbon, Portugal.